Students from the University of North Dakota Accounting 494 Ethics class have recently collaborated with several American Indian students to talk about social, historical and cultural issues related to American Indian people. They have worked under the guidance of Michael Hendrickson, Executive in Residence ethics instructor, and Courtney Souvannsacd, formerly American Indian Student Services Administrative Assistant. These meetings were initiated to create dialogue about racial assumptions, the regrettable treatment of American Indian people throughout United States history, and ultimately, to discuss equitable solutions in the context of a unified campus community. American Indians are the largest minority group with five tribal reservations in North Dakota representing just over five percent of the population. Although they are the largest minority group, conversations with American Indian students reveal that they are treated as “less than”, they feel misunderstood and that their culture and heritage are seen as unimportant. That can change. Students have committed to write a series of articles that will be organized in a timeline of past, present and future with various topics about the truth including the Doctrine of Discovery, broken treaties, boarding schools, and denigrating stereotypes and articles about healing through achieving campus and community inclusiveness. The approach adopted by the students mimics the Truth and Reconciliation concepts adopted in South Africa following the end of apartheid in 1990. The South African approach, which was championed by Nelson Mandela and Archbishop Desmond Tutu, was an endeavor to heal through remorse on the part of the perpetrators and forgiveness on the part of those victimized. Their approach taught us that true healing occurs only when there is an admission of the wrong and a corresponding forgiveness by the victim. Like the black people in South Africa, the pain of discrimination felt by American Indians is real and occurs on our campus and in the surrounding community. In exploring the American Indian students’ stories, there are parallels in the struggle to have a voice and credibility in the face of prejudice and racism. Although sharing their stories has been difficult, it is not a cry for sympathy, but a call for understanding. An important part of healing is that the truth be told. We are often afraid to hear the truth because the truth makes us feel like we need to do something – and maybe we do, but sometimes we just need to acknowledge the truth and start there. That is where we seem to be at this point in history - of acknowledging the truth because it has not been set forth accurately in our history books. Not one of us writing these articles was taught the truth in our schools. The teachings we received gave only limited information in a very generalized and romanticized way and excluded the American Indian perspective. There is a disquiet for whites in learning that the land they call their property was obtained by force and deception. The means by which property was obtained was aided by the simple fact that the natives had no concept of property ownership. The native people felt that they were part of the land and not the lords of it. They moved with the waters and the grasses and the idea that the land would be exploited for personal use was a strange and unknown concept. This project is not about being politically correct but about being relentlessly honest. It is time to set us all free because the truth can only hurt us if we keep it hidden in the dark. As the Bible says – the truth shall set you free. The goal here is to acknowledge the truth about our history and what really happened. The truth is important because without it we will continue to live in a cocoon of silent lies that hurts everyone. In 1823, Chief Justice John Marshall wrote the Supreme Court decision in Johnson versus McIntosh, which concluded that colonial land succession rights were superior to native rights. The bases for the superior rights of colonial succession were papal edicts and a British monarch’s order that were issued more than 300 years before the Supreme Court decision. The Court’s decision was both curious and questionable for a new country that had separated church and state and thrown off the yoke of a monarchy. Yet, those were precisely the sources that Marshall used to prohibit “legal rights” to native succession. At issue in the case was the simple question of whether a Native American could transfer title to private property to an individual. Author and law school professor Eric Kades and others suggest that the very nature of the lawsuit is suspect since there was no actual conflict of title because the lands did not overlap one another. This suggests that the case is one of theory and not of actual fact. Author Steve Newcomb explains the basis of the decision this way. In 1452 and 1455, Pope Nicholas V issued edicts that gave Portugal the right “…to invade, capture, vanquish and subdue…to reduce [the native peoples] to perpetual slavery…to take away their possessions and property.” Pope Alexander VI gave the same rights to Spain in 1493 following the first voyage of Christopher Columbus. In 1495, King Henry VII issued an order authorizing John Cabot to claim lands for England if the lands “discovered” were occupied by heathens and infidels and had not been claimed by other Christian nations. Attorney Tonya Gonnella Frichner (Onondaga Nation), President and founder of the American Indian Law Alliance, spoke about the Doctrine of [Christian] Discovery at the United Nations in 2011. She said, “What we have found is that the doctrine of discovery has been institutionalized in the laws and policies on national and international level(s) and lies at the roots of the violations of the indigenous people's human rights, both individual and collective." Subsequent writings about the decision and later court decisions were couched in additional curious language, including the idea that the indigenous people were not in fact nations at all and thus did not have standing with respect to the land. Henry Wheaton, the court reporter for Marshall’s court, said that the natives had lost their sovereignty when the lands were “discovered” and thus only retained a right to occupancy. How is it possible that the American Indians were not sovereign nations when treaties were negotiated with them? What was their standing in the treaties if not as a nation? In fact, if you research the treaties, the word “Nation” was repeatedly used in reference to Indian tribes. The bottom line is that the lands were stolen and subsequent legal decisions were simply rationalizations of the European conquest. Of course, neither stealing nor conquest is a legal basis for possession and both have been outlawed in modern times, most significantly by the United Nations. The way the lands were taken needs reconciliation or as Mark Charles put it, we need “conciliation” – meaning resolution. When we sit and look into each other’s eyes and listen to each other’s hearts, we come to a different conclusion – a conclusion that says we are all brothers and sisters and just perhaps ‘this land belongs to you and me’. The idea of reconciliation can begin with a simple concept – that the resources of Earth belong to everyone and that they ought to be used in a way that honors all life. Students at the Carlisle Indian School, Carlisle, PA, circa 1890. Cumberland County Historical Society, Carlisle, PA.
Taken by John N. Choate, who was commissioned by the school to make portraits of the students as a public relations effort showing the success of the school in assimilating the Indians. This article is a part of the wider Truth and Reconciliation series of articles, and seeks to provide some historical context about what American Indians have faced in history and how they continue to be affected today. The story of the American Indian Boarding Schools is that of attempted assimilation. It started as day schools on or near the reservations, where young American Indians were offered a chance to attend school during the day, and return home in the evening. General Pratt was the founder and longtime superintendent of the Carlisle Indian Industrial School in Pennsylvania, which established a model for other Indian boarding schools. American Indian children were recruited from across the country to attend. If parents resisted, they were often coaxed or coerced into the idea that it was just about education. In the end, they were torn from their families and severed from their indigenous culture. At Carlisle and at other Indian boarding institutions, American Indian children were strictly forbidden to speak their tribal languages or practice their native religion. Their clothing was burned and replaced with military drab, and long hair was cut and styled in Euro-American fashion. Cutting an Indian child’s hair might not seem significant at first blush, but it was an emasculating process for most natives. As American Indian Studies academic Anton Treuer describes in Everything You Wanted to Know About Indians But Were Afraid to Ask, the cutting of hair is an expression of the loss of a loved one, a loss of a relationship, and a loss of a part of self. Ultimately, the assimilation attempt failed—there are 566 federally recognized tribes of the United States still active today—but its effects still linger. 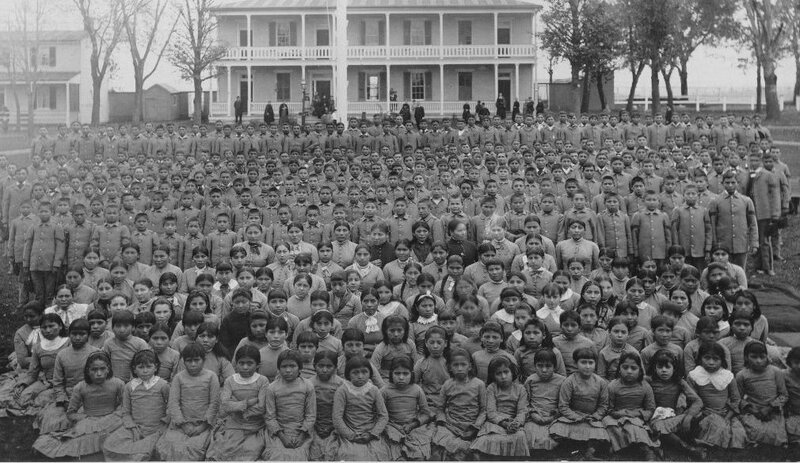 For American Indians, the boarding school left a lasting distrust of the entire U.S. education system. Many American Indian educators recognize this distrust and that it is so strong that young American Indians often choose not to attend post-secondary schools. When considering the history of boarding schools, it’s important to remember that this is not so distant history. Many of the native students on the University of North Dakota campus have parents, grandparents and other relatives who have attended American Indian boarding schools – indeed, one of the writers in this series of articles had a grandfather who attended one. The effects of this “historical” trauma remain in the family to this day. Before there can be reconciliation and healing, we have to come to terms with this “historical” trauma that affects many native students. Before we can be truly inclusive and diverse, we need understanding. As we continue with our truth series we take a brief look here at how treaties were used to take the lands of the indigenous people. The official history site of the United States says: The U.S. Government used treaties as one means to displace Indians from their tribal lands. Other more vicious methods were also used including extermination, starvation, assimilation, and discrimination as well as the regular practice of breaking treaties. How can it be that treaties are made and then broken unilaterally by one party time and time again? Throughout our global history treaties were broken when one party intended to go to war with the other party – the U.S. was no exception. Arthur Spirling, Harvard professor, concluded that the strategy of the U.S. government was to make take-it-or-leave-it offers leaving the tribes powerless to object. The treaties were broken so often that it became obvious that breaking treaties was the strategy of the U.S. government. As we saw in the Doctrine of (Christian) Discovery article, the Supreme Court “rationalized” land succession by disavowing that the natives had a right to the land. However,author Stuart Banner concluded from his research that it was implicit in the agreements that the Indians actually owned the land and were thus able to trade it away. Looking at the various treaties, one sees that the U.S. government used the term “Nation” intentionally and assumed that the natives were transferring their right of possession. As one reads treaties this right becomes an indisputable fact. Nebraska Studies simply describes the treaties as those between “Sovereign Nations”. In 1863 in connection with the signing of the Old Crossing Treaty, Alexander Ramsey arrived on behalf of the U.S. government with 300 troops and a Gatling gun. Ramsey presented the Treaty as a right to pass through Ojibwe country. However, the Treaty actually ceded 11 million acres, including most of the Red River Valley of North Dakota and a substantial portion of northwest Minnesota, to the U.S. government. The Senate made several changes to the Treaty and Many Ojibwe refused to sign it. Bishop Henry Whipple said the Treaty was a fraud from beginning to end. Note that Grand Forks and the University of North are located on these lands. An additional 9 million acres were ceded to the U.S. government under the McCumber Treaty (known as the 10-cent Treaty). The Treaty was made in 1892 but Chief Little Shell III refused to sign it so the government waited until after he died and finalized the treaty in 1904. A common misconception is that American Indians are compensated in many ways for their lands, such as free education, monthly checks and no taxation. First, American Indians pay for college the same way other students do as they compete for funding and scholarships. Second, a quick look at the poverty rates on the reservations will dispel any notion that American Indians are receiving government handouts. Poverty rates on larger reservations in the tri-state area of the Dakotas and Minnesota are three to four times the state averages and nationwide extreme poverty rates on larger reservations are as much six times the average rate for the nation. Regarding taxation, one study estimated that every Native American man, woman and child in North Dakota contributed an average of $1,342 in taxes in 2012 – a lot of taxes for an impoverished people! One prominent treaty that is significant to the Indian struggle is the Treaty of New Ochota, which was ratified by Congress despite objections by Daniel Webster and Henry Clay. President Andrew Jackson, who history has shown was extremely corrupt in numerous ways, engineered the signing of the Treaty with a tiny fraction of the Cherokee Nation of Alabama and Georgia. The majority of the Cherokee objected to the Treaty and tried to keep their land but they were driven out by Federal troops and Georgia militia and forcibly relocated to eastern Oklahoma. The relocation is known as the “Trail of Tears” because more than one-fourth of the Indians died in route due to the brutal conditions. This happened even though the Supreme Court had ruled that the individual states had no rights to Indian lands. Andrew Jackson ignored the Supreme Court and sent federal troops to drive out the Cherokee. He said that if the Court wanted the Indians to have rights they could enforce their decision themselves. No treaties are more significant to the people of this tri-state area and to tribes that comprise the Great Sioux Nation than the Treaties of Fort Laramie. Approximately 10,000 Indians gathered in 1851 from numerous tribes, including the Sioux, Crow, Mandan, Hidatsa, Cheyenne, Arapaho and others to define boundaries for various tribes. The 1851 Treaty set boundaries with the Great Sioux Nation for the first time. The map [map 3] shows the boundaries and it is important to note that the Treaty set the eastern boundary at the east side of the Missouri River, thus acknowledging that this section of the Missouri River was part of the Great Sioux Nation. Settlers were allowed to cross the lands but only in designated places along established trails. By 1868 the U.S. government intervened allegedly due to skirmishes between settlers and Indians. The government wrote a new treaty, the 1868 Treaty with the Sioux Nation, which covered the same area but gave different distinctions to the Reservation lands outside of what is now South Dakota [Map 4]. Chief Sitting Bull said, “They want us to give up another chunk of our tribal land. This is not the first time or the last time.” And it wasn’t as the Reservation shrunk dramatically. In 1874 in clear violation of the Treaty, the government sent Custer into the Black Hills where he led an expedition of over 1,000 soldiers and others to evaluate resources. Speculation soon surfaced that there was gold in the Black Hills and the sacred Black hills could no longer be part of the deal. Once again the government reneged and by now the pattern was clear just as Sitting Bull had observed. The U.S. government stopped entering into treaties with Indians in 1871 and in 1877 they simply broke the Sioux Nation Treaty and annexed the Black Hills and all of the western one-sixth of South Dakota. By 1889 the Sioux tribes had no voice left and their reservation was cut in half and tribes were segregated. [Map 5] The Great Sioux Reservation became a microcosm of the 1851 and 1868 treaties and it became impossible for the tribes to continue their way of life. The hunting grounds, which were to remain so long as the buffalo roamed, were decimated as Buffalo Bill and others had needlessly slaughtered most of them. No justice occurred until 1980 when the Supreme Court ruled that the 1968 Treaty had been violated and that the U.S. government had wrongfully taken the Black Hills and wrongfully terminated the hunting rights. In 2011, PBS reported the value of the unclaimed monetary damages to be $1.3 billion. The Sioux have refused the money – they want their sacred lands. It is for them the Garden of Eden where the creator breathed life into them. This is but three examples of the nearly 600 treaties, most of which were unilaterally broken by the U.S. government. This needs to be healed – the Broken Treaties as well as the (false) Doctrine of Discovery – and they can be if we all have the will to reconcile and take some courageous steps. Throughout this series we examine the numerous abuses committed against the Native American people in both the past and the present. From the Doctrine of Discovery to stereotyping, we delve further into the racism and genocide that mars the history of our country and continues to negatively impact how Native Americans are perceived today. We have told many painful truths in hopes of promoting understanding and we hope this understanding continues as we move to the next article in our series. “Mni wiconi.” Water is life. This is the rallying cry of the men and women protesting the Dakota Access Pipeline (DAPL) which would bring up to 570,000 barrels of crude oil from North Dakota to Illinois daily if completed. Since April 2015, a steady stream of DAPL opponents have arrived at camps north of the Standing Rock Reservation. Without funding for lobbyists or expensive lawyers, these brave men and women have fought back against the DAPL the only way that they can--civil disobedience and peaceful protest. Currently numbering over several thousand and with representation from over 300 Native tribes and people all over the world, the opponents of the DAPL are concerned about the safety of the pipeline, which will cross Lake Oahe just a half of a mile from the Standing Rock Reservation. A spill from the pipe could affect the water supply of over 18 million people, including the drinking water of the Standing Rock Reservation. The crisis in Flint, MI has taught us that safe water in the United States is no longer a guarantee and the DAPL has the potential to endanger the health of millions if it leaks, which is a very real possibility. According to the Pipeline and Hazardous Materials Safety Administration, there have been over 3,300 incidents of pipeline leaks and ruptures since 2010. Even the smallest leak could contaminate the tribe’s water supply and wreak havoc on local wildlife. As Deepwater Horizon, Exxon Valdez, Eagle Otome, and other oil spills have shown, there is no way to completely assure the safety of drilling for and transporting oil. There will always be a risk of disaster and the DAPL could be a 570,000 barrel-per-day disaster if allowed to proceed. Ironically, concerns about water contamination caused the pipeline to be moved from northeast of Bismarck to its current location, which raises the question of why one population should be protected from water contamination, but not the other. In addition to concerns about water, activists point out that the resources would be better spent developing renewable energy. Whether or not you believe in climate change, no one can deny that our supply of renewable energy is limited. According to BP, we have enough recoverable crude oil in the world to last about 53 years at the current rate of use, so it is imperative that we begin investing in renewable energy sources, not pipelines that will become obsolete within our lifetimes. Overshadowing all of the environmental issues is the fact that the pipeline will cross Native American sacred lands. While none of this land is owned by the current Standing Rock Reservation, the 1851 Fort Laramie treaty granted the land, including the Missouri River, to the Lakota people, but shortly afterward the US government violated the treaty and forced the Lakota people to an even smaller patch of land. This continued the long tradition of the United States government violating treaties with Native people. On the lands given to them in the 1851 treaty, Native Americans buried their most esteemed fallen warriors, making the land similar in prestige to the Arlington Cemetery. The land is also used for sacred Sun Dance ceremonies where Plains Native Americans gathered to pray and conduct their most important ritual of the year. The pipeline cuts through these sites, which hold the same value to the Native Americans as any church or place of worship, and desecrates the burial sites of their ancestors. Contractors have already reportedly destroyed one archeological site and protesters worry that there may be more to come. Proponents of the pipeline claim that Native American tribal officials refused to meet with the Army Corp of Engineers to outline areas of cultural significance and prevent the destruction of artifacts. But even if that was the case, it is difficult to blame the Native Americans for not wanting to meet with the US Government considering the multitude of broken treaties, genocide, and cultural extermination which continue to affect relations today. It is difficult not to admire that, despite centuries of oppression, Native people refuse to be silent and continue to fight courageously against threats to their home, community, and way of life. The DAPL endangers not only their water supply and the environment as a whole, but also the religious sites that define their heritage. Despite these threats, construction has continued on the pipeline and the Native concerns have been generally disregarded. We can’t begin to reconcile with the Native people until we stop waging war against them and begin listening to their concerns. On December 4th the Army Corp of Engineers announced that it would not issue the required easement for the present location. However, it is clear that an alternative route will be considered. Although it was a great victory for the water protectors, it is likely only one step in a long battle for the protection of our waters. The black snake is still alive! Remember your first Welcome Weekend? Students being dropped off at the residence halls, meeting their roommates, attending various events, and maybe even attending a college party for the first time. Students are balancing between nervous yet excited for what the year will bring. But, it is not always just nervous excitement for all students. Hannah Balderas, co-author of this article, is a senior here at The University of North Dakota (UND), majoring in psychology/pre-med. Initially, she came to UND because it was the only college in North Dakota that offered the major in which she was interested at the time. Her heritage is Arikara, Santee Sioux, Little Shell Anishinaabe, Mexican-American, Irish, and Italian. “I recall my first big day of being on campus and assuming that UND was going to be my new home, where I would continue my education. I remember being called to go to the Memorial Stadium to take a class picture. As I was making my way to a seat, a UND Athletic Sports member called out to me using the word ‘squaw’.” For those of you who don’t know, it is a highly offensive and derogatory term to identify an Indigenous woman. “Initially, I didn’t know how to react because that had never happened to me back home in Twin Buttes, North Dakota. When I was alone, I cried and contemplated whether I should stay at UND. It was, after all, my first official day here on campus and I felt so disrespected. I decided to stay because I knew there were other Indigenous students in the same situation. In other words, I stayed for My People and used the insult to inspire me to continue to improve my education in and out of the classroom.” Hannah continued her education, took on leadership positions and while mentoring other students she encouraged them to also continue with their education when others made discriminatory comments. This article was not written to single out wrong doers or ignorance; but rather with truth and, especially, reconciliation in mind. Our first step is to acknowledge what has happened and then to realize that each of us can change for the better. Perhaps just reading this article is a start to help heal and reconcile. May each of us make a conscious effort to approach one another in unity, peace, and respect. As the Truth and Reconciliation series of articles continues, we look at reconciling past and present concerns. The University of North Dakota (UND) draws most of its students from North Dakota, South Dakota, and Minnesota, all states with a large population of American Indians. In North and South Dakota, American Indians are the largest minority group while in Minnesota they are the second largest after African Americans. Even though they are a large part of the population, some American Indians feel overwhelmingly underrepresented and misunderstood. The first inhabitants of this area were American Indians who arrived at least 9,000 years ago. White settlement began in earnest in Dakota Territory in 1861 and in Minnesota Territory in 1849. White settlers who were mostly Scandinavian and German came primarily for the purpose of homesteading farmlands, and in Minnesota for mining and logging as well. The European white settlers had dramatically different ideas than American Indians about land ownership, the environment, and spirituality. These differences help explain a then prevalent European view of natives as savages and heathens whose culture was irrelevant. Before the Europeans arrived, American Indian tribes were spread throughout the Great Plains. They practiced their spirituality and ways of life as they saw fit. American Indians didn’t have the same concepts of property ownership as the Europeans; rather than owning the land, they lived on the land and cared for the Earth as if they were connected and a part of it. The European settlers came without the same regard for the environment, and sought ownership in order to derive value. With more modern sensibilities, it is now apparent that we had something to learn from American Indians about how to care for the land and water and, perhaps, how to heal our vital resources. As settlers moved across the U.S. and onto American Indian lands, conflicts frequently arose. Reservations were created through war and conquest, and formalized by treaty negotiation. Treaties were originally set in place to delineate land where the American Indians could live. Today reservations are scattered across the tri-state area that are home to different Native American tribes including those of the Great Sioux Nation (Dakota, Lakota, and Nakota), Chippewa (Ojibwe) and the Three Affiliated Tribes (Mandan, Arikara and Hidatsa). Across the UND campus there are a vast number of different minorities and individual differences. Some students are first-generation college students. Others are from small town rural America and some students are from large metropolitan areas. Hundreds of students are from other countries with different cultures and languages. Even if these students aren’t a minority in the racial sense, some may still feel like outsiders because of other differences. When minorities are discussed, some people automatically think of race. However, race is only one characteristic of people. In some respects we are all different, but these differences are what create community - in our case, the UND community. Differences in culture, language, and values should not separate us; they should unite us. It is important to realize that each individual comes from a different background and should be celebrated. Diversity gives us the opportunity to learn to appreciate difference and uniqueness. It is up to each of us to build the friendly relationships and bridge gaps in understanding to truly care for other people and humanity. Jake Aden, Co-Author of this article, says “During our initial meeting with American Indian Students at the American Indian Center at the beginning of the truth and reconciliation process, I, and the rest of my non-Native group, felt uncomfortable and out of place because we were the minority. However, even before the end of the first meeting those initial feelings of discomfort were completely gone when we realized that we were all students.” If we are brave enough to face that initial awkward stage, those gaps in understanding can then truly be bridged. Hannah Balderas, an American Indian student at the University of North Dakota, stated in a “We are Grand Forks” article, “An important part of our culture is that everybody feels a responsibility to take care of each other.” Relationships and understanding can help us create a greater sense of unity in society and across cultures. A new relationship between American Indians and non-Natives will allow us to develop a new perspective on how we treat each other and how we treat our earth. How about a Powwow as a step toward inclusiveness? What does inclusiveness mean to you? Perhaps it is being accepted and respected regardless of culture or beliefs. However you visualize inclusiveness you can probably think back to a time when you felt included and the happiness associated with it. Inclusiveness allows groups to live in harmony and can help heal past injustices. This is why creating a culture of inclusiveness at the University of North Dakota (UND) is so important. How can we create a culture of greater inclusiveness? One way is attending events sponsored by different groups throughout the year. Every year in the spring UNDIA hosts the Wacipi Powwow while ISA hosts Time-Out-Week. The timing of events and collaboration between groups is meant to bring culture and education together. The Wacipi Powwow and Time-Out-Week bring people, not only from the local area, but also from all over the nation. The Powwow is a celebration of life with dance and drumming competitions, food, prayer and the opportunity for old friendships and new. Time-Out-Week is an educational week of events on culture and contemporary issues leading up to Wacipi. Natives and especially non-Natives are welcome and encouraged to attend any of these events. If you look at the monthly events calendar for UND you will realize that the above examples only scratch the surface of the events hosted by American Indian groups. However, if you were to ask a non-Native whether or not they have attended one of these events during their time at UND the answer would probably be no. The reasons vary but quite often it is that students do not realize how welcome they are at these events. If you read the UNDIA Constitution their purpose is to promote a better understanding of cultures between American Indians, students, faculty, staff, and the general public. We constantly hear the word “inclusiveness” thrown around, especially on campus, which seems to desensitize us from the real power it holds. Even with the emphasis placed on inclusiveness a quick search on the internet indicates that different groups across college campuses seem to be more divided than ever. Each and every UND student has the opportunity to help shape a culture of inclusiveness, on and off campus. It is important for each of us to take opportunities to build new relationships and develop a broader and deeper understanding of our campus community, city community, and all the cultures within them. Possibly the largest cause of division between individuals and groups on UND’s campus is a lack of dialogue. Think about any negative perceptions you may have of another group on campus. Were those perceptions a result of direct dialogue with that group or some preconceived notion from an outside source? The authors guess it might well be the latter. It is not easy to overcome beliefs and perceptions we have built up over time. Do not underestimate the power of taking a small step, such as attending an event like the ones mentioned earlier. All it takes is two people to start a dialogue. Will you be part of the effort to shape a culture of inclusiveness at UND? How about the Wacipi Powwow? While you are there you might try an Indian taco! Forward: I, Sashay Schettler, speak from my perspective as an individual American Indian student and cannot claim to be a voice for all of Native America, just as Hunter Jerome cannot claim to speak for all white Americans. In November Mark Charles, a Navajo from Arizona, spoke at the University of North Dakota and delivered a very powerful message. He spoke about things we do not talk about and how the silence has manifested a false mythology. 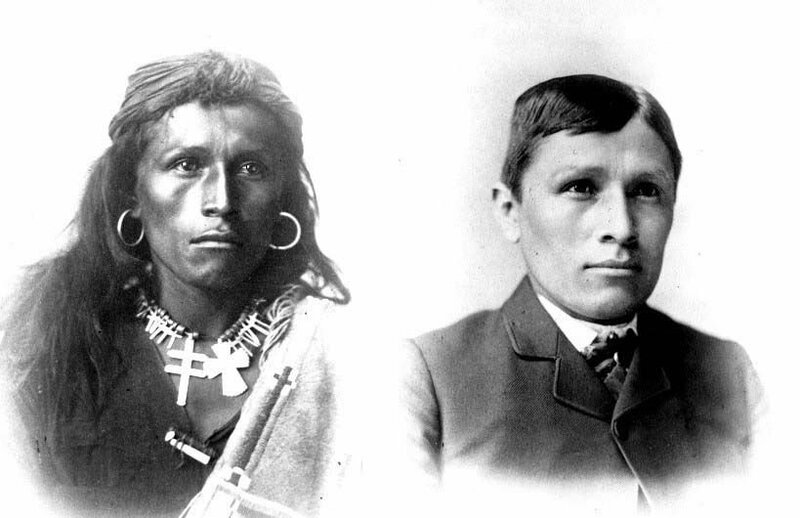 American Indian history is based on a mythology of America where American Indians are labeled as “the other” and not part of contemporary society. Despite finally gaining full citizenship in 1924, the label “the other” is still perpetuated in school systems and spills over into everyday life. The brand has left American Indians as well as other Americans scarred by a fictitious history. Ignorance of history and an unwillingness to acknowledge and accept what truly happened has contributed to the regrettable conditions of many American Indians. Healing can only occur when the truthful history is accepted, instead of a mythology crafted to hide past sins and obscure current conditions. Many of us need to be willing to go beyond our comfort zones and acknowledge that many people have been hurt deeply. Indian and non-Indian relations can heal by acknowledging our common objectives, celebrating a truthful history, and honoring our differences. The road to reconciliation begins when truth is acknowledged, forgiveness is humbly requested, and then open-heartedly granted. These collaborative articles about Truth and Reconciliation are a great start to bridge our distorted histories into one collective truthful history. Forming a common memory will help create a common community – one that shares a common story of our potential greatness.